Most farmers struggle with getting accurate and localised information on their farming practices, on crop diversification or opportunities for new cash crops. However, they find information that they get on centralised helplines too technical and not contextual enough. The result: 1 in 2 farmers that we surveyed in Bihar told us that fertiliser shops are their go-to sources in case they want information on seeds, fertilisers and what quantity of fertilisers to use, or what to do in case of crop loss. 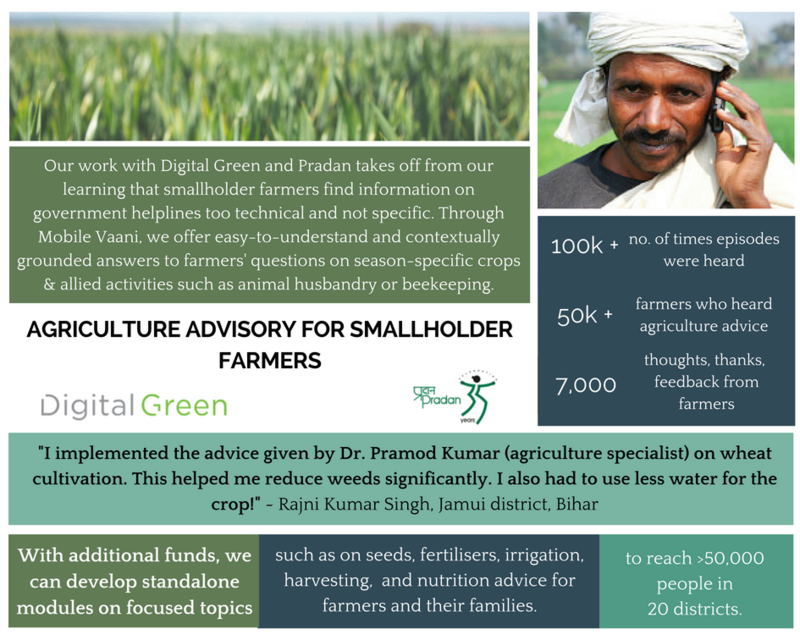 We collaborated with Digital Green and Pradan to offer simple, contextual and easy-to-implement advice on farming techniques and diversification. We hope to expand this service to more crops and on the ignored but critical issue of nutrition of farmers themselves and their families.